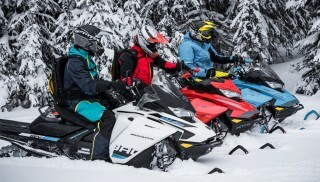 The 2020 Ski-Doo Freeride 165 is ready to go where few sleds can follow in the steep and deep, but it has some competition in the way of its new brother – the Summit Expert. Track: 165 x 16 x 2.5"
Ski-Doo built the Freeride around the fourth generation REV chassis, known as Gen4 or G4. This is the chassis that possibly lifted Ski-Doo to be a leader in mountain snowmobile sales, rivaling that of Polaris. For 2020, the Freeride has a new competitor – one coming from within – the Summit Expert, an upgraded and amped-out Summit X, which we’ll discuss toward the end. 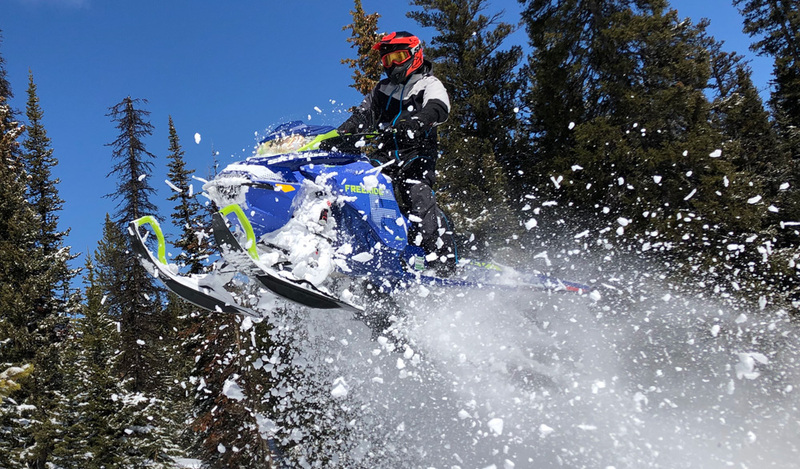 From our perspective, the shine on the Gen4 mountain masher with 850 two stroke power pumping out 165 horsepower from two cylinders, elevates the 2020 Ski-Doo Freeride 165 as a mountain sled that seeks to rule the mountain tops. The motor displaces 849cc, is a liquid-cooled twin cylinder two-stroke with direct electronic fuel injection and electronically controlled exhaust valves – eRave. The GEN4 Freeride is simple to ride in deep powder. where with its narrow platform, moving in deep powder is easy. The motor’s direct injection features cylinder head voice-coil injectors that deliver a precise fuel and oxygen mix. Also the 850 has booster injectors that sit atop the motor on the intake side. The idea behind the booster injectors is to deliver to the motor an added “boost spray” (air-fuel mixture) when the motor’s throttle is snapped hard at mid-range and high RPM. To simplify this, is to say, the boost injector system is like a mini nitrous system. Not as radical as nitrous, but works in same concept using the snowmobile’s own fuel. And so, what does this mean to the Freeride? Throttle response is snappy, precise and there when you need it; when it comes time to hit back at a mountain that is trying to defeat the climber and his or her mission, the big 850 with boost injection, gives the Freeride extra oomph to hit back and win. The 849cc Rotax delivers its peak 165 horsepower at 8,000 RPM with more than 106 lb-ft of torque. As a side note, this motor is the same used in the Summit X, Summit SP and Summit Expert – also a Summit X. A Freeride is more than a hill dropper and jumper, it is a deep powder hound. To free up the 2020 Ski-Doo Freeride 165’s power and deliver it to the track is the pDrive clutch. The pDrive has friction-free dual rollers instead of sliding buttons. The oversize rollers with needle bearings, wide flyweights and shaft-on-shaft design, give the Freeride smooth shifting. 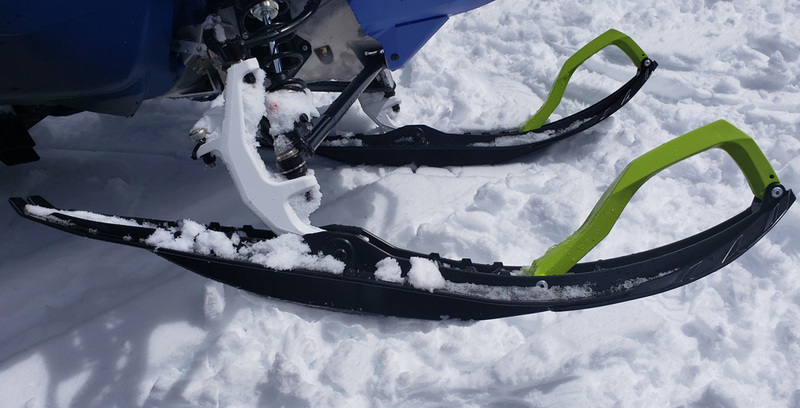 The Freeride relies on Ski-Doo’s RAS-3 front end with unequal length A-arms. This front suspension is easy to mash into a hillside, is silky smooth to turn and provides excellent control in harsh conditions. For a mountain snowmobile, the Freeride is a pleasant critter to mogul bash. For 2020, Ski-Doo made a change to Freeride’s RAS-3 to keep the ski flat as it slides over both visible and unseen obstacles – the tip does not flip up. For us, the important factor here is, the updated ski spindle and ski stop delivers improved (better) handling and rider-confidence on steep sidehills and chopped up terrain. We’ve learned, when the Freeride in the correct sidehill conditions as it cut across tracked-up and deeply-trenched snow, it will want to move from horizontal line to take a vertical line, thus leaving the rear end – the back axle – to wash out the track, leaving the driver to course correct; more often taking the Freeride to vertical; the 165 not as much, but the 154 more so. The new spindle keeps the ski to the surface. The new ski spindle and rubber plate prevents the ski from yo-yoing. The new ski spindle and rubber boot mount, keeps the Frreeride’s skis flat. The goal is to prevent tipping up on sidehill cuts and when encountering an obstacle. Continuing, the new spindle – if and when the driver careens head on into a snow wall – prevents the Pilot DS-3 ski from pointing straight up and becoming an emergency brake; the Pilot DS-3 skis will stay flat and will the chassis bridge over the wall or any nose-high obstacle. This improved and updated spindle is the same as used on the 2020 Summit Expert. The Summit X and SP do not have this improvement. Under the tunnel for Freeride is the tMotion rear suspension wrapped by the PowderMax Light track with FlexEdge technology. The FlexEdge track is a 3.5-inch pitch track that is 16 inches wide. The track’s wide footprint makes the 154 equal to the other OEM’s 160s with 15-inch wide tracks, and the 165 Freeride equal to footprint to Polaris’ 174 Pro-RMK, which has a 15-inch wide track. The 2020 Ski-Doo Freeride 165’s front shock is a KYB Pro 36 R Easy-Adjust. The rear suspension front and center shock is the KYB Pro 40 Easy-Adjust. These are coil over remote reservoir shocks that are rebuildable. The Easy-Adjust compression damping-knob eliminates the need for tools to adjust the shock’s dampening. The Freeride’s shock package makes it a wicked powder killer and mogul tamer. Ski-stance for the 154 and 165 Freeride is 35.5- to 37.5- inches. The Freeride’s runningboards and the rear-most portion of the slide rails are reinforced (strengthened) to absorb impact energy from long drops. Only the Freeride, of Ski-Doo’s mountains sleds, have this. Reinforced slide rails and runningboards are designed to handle the big impacts that Freeride owners are prone to deliver. The Gen4 Freeride is a highly-capable mountain snowmobiles; easy to initiate a sidehill with its new spindle, and is gentle to maneuver. Deep-powder carves are simple to lay down with minimal body input to the chassis. But, when riding the 2020 Ski-Doo Freeride 165 at same time on same mountains as the Summit Expert, the tall bars and tall seat on the Freeride make it feel old tech. Oh, you all can carve by straddling the seat, dipping the inside shoulder, lifting the outside foot from the runningboard and apply pressure to the inside runningboard to rip from its seems a tight righty tighty, but, the Expert, ooh la la, can do it easier, all because of the Expert’s low bars. The Expert’s handlebar post gives it a huge advantage over the Freeride. Some advice. 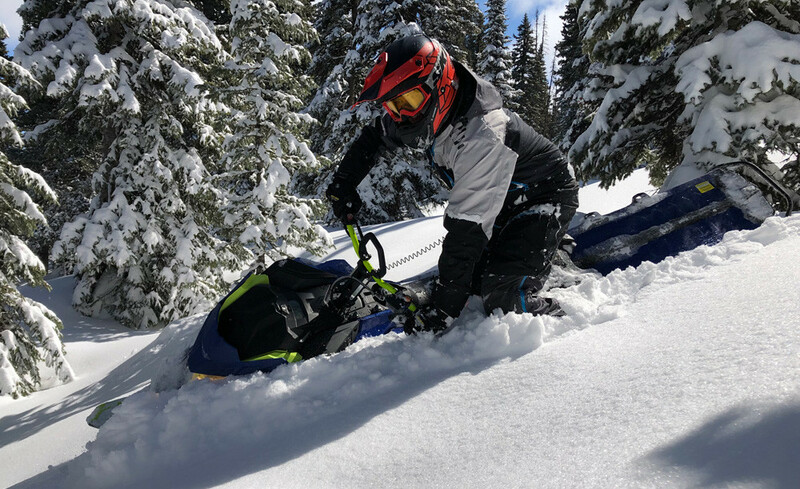 When you order your 2020 Ski-Doo Freeride 165, order too from Ski-Doo’s accessory catalog a post lower than you think you need. 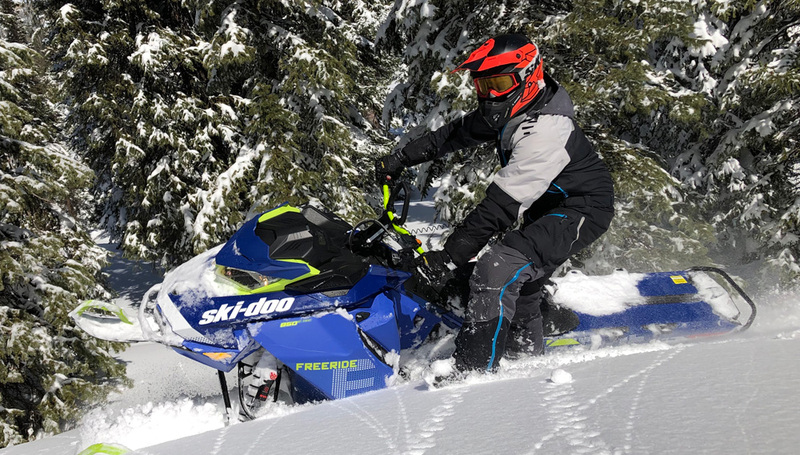 The 6.5-inch handlebar post shipped with the Freeride is general for all riders, but to get down and nasty with this sweet snowmobile, order a 4.5-inch post from Ski-Doo. 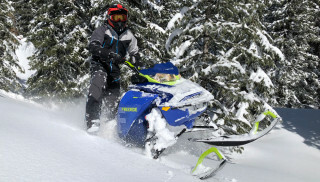 A low post – though it sounds odd – forces the body to be properly positioned over the track’s drivers and also more forward, this prevents the driver from “getting behind the sled and the sled ahead the driver,” according to Bret Rasmussen, owner of Ride Rasmussen Style and sponsored Ski-Doo backcountry athlete. The 2020 Ski-Doo Freeride 165 is a nimble powder player with great all around general-fit ergonomics, a narrow chassis that doesn’t panel out, and runningboards that clean off well; the runningboards for 2020 are now “rigid full-length extruded aluminum grid-style design with wide openings for exceptional snow evacuation and superior grip. [These give] flat foot positioning for comfort and control, plus a 1 lb. weight reduction.” The board’s extrusion and holes for 2020 are deep into the foot wells. We like its seat, but after hopping across the Expert’s shorter and less-in-height FORTY7C seat developed by Carl Kuster, the Expert’s seat makes the Freeride’s seat antiquated. A narrow cockpit, SHOT and a mountain strap help the driver have an in-controlled experience in the steep and deep. Given the Summit Expert to Freeride comparisons, the 2020 Gen4 REV Freeride continues to be an almost everything deep-powder snowmobile and with its shocks, it has the capabilities to hit trail moguls with confidence. It is nimble as all Gen4 deep-powder snowmobiles are, the Summit X, SP and Expert included. 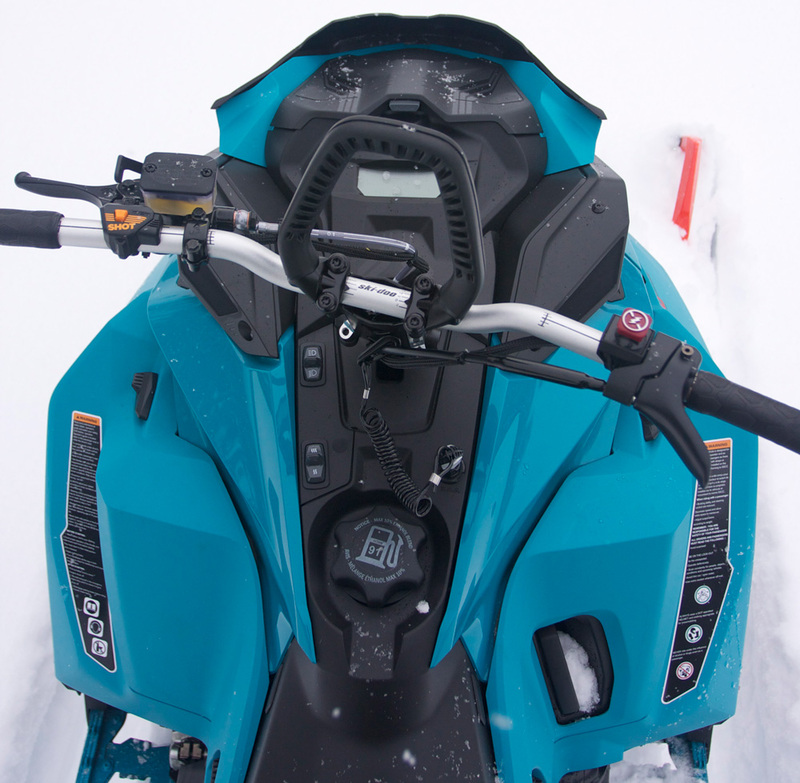 The 2020 Ski-Doo Freeride 165’s shock package, and slide rail and runningboard reinforcements, make it tank tough, while feeling paper light through the handlebars. The 850 motor is quiet and sneaky strong. And one feature it has is SHOT – Start Hot – that delivers the benefits of owning electronic start without having the disadvantages of traditional heavy electric start.